This Wednesday we head back to one of our favorite venues to see live music in this fair city, The Basement, and we’d love for you to take a short breather from your busy week and join us. The lead act of the evening is Nashville-based Americana folk outfit, Cassino. Originally formed in 2005 by childhood friends and former members of the Alabama-based rock band, Northstar, Nick Torres and Tyler Odom, Cassino is a project that has morphed and transitioned through several different stages and identities. In 2006 the duo began recording their first album, Sounds of Salvation, with producer Craig Krampf in Nashville. Cassino spent the following couple years touring heavily in support of their debut record, until 2008 when they began the process of writing a follow-up album in 2008. It was during this process that Odom left the project and Torres began to seek out a new creative direction for Cassino. He found what he was searching for in longtime friend Edward Puckett, who often played bass on earlier Cassino tours. The two musicians spent much of the following year writing and recording the new album, again in Nashville, but this time primarily out of a small apartment. The album would come to be titled, Kingprince, and was released in 2009. In 2011 they put out an EP entitled, The Weight of Bother, which contained several unreleased versions of songs from Kingprince. Cassino has spent much of their time the last couple of years touring the country, and is now currently working on a new album comprised of songs based from of wealth of new inspiration. 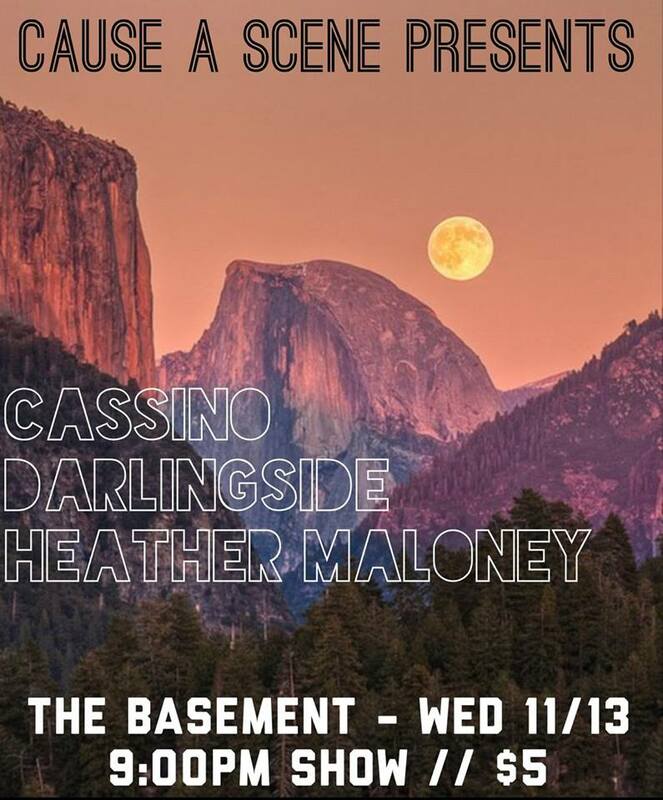 Sharing The Basement stage with Cassino Wednesday night is the indie folk quartet, Darlingside. Hailing from Cambridge, MA, this foursome, delivers a distinct and colorful live performance that has captivated audiences across the country, in which they belt harmonies huddled around a single microphone and swap and series of instruments which include guitars, mandolins, fiddles and a plethora of percussion instruments from song to song. 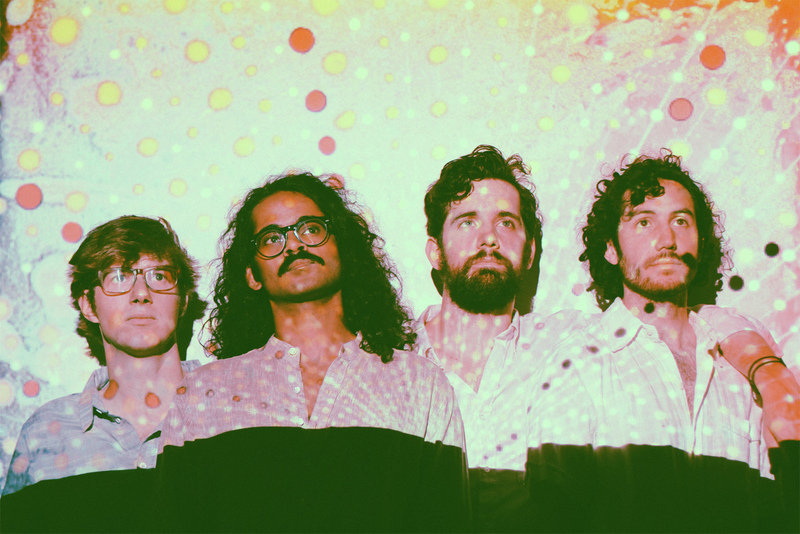 The band released their first full-length record, Pilot Machines, on which they were successful in encompassing the same spirit and energy that they bring to all their live shows. Opening up the show for the evening is another Massachusetts-based musician, singer songwriter Heather Maloney. Although she only began writing songs a few years ago, Maloney has put her career and reputation on the fast track towards success releasing three albums, and quickly developing a devout fan base. 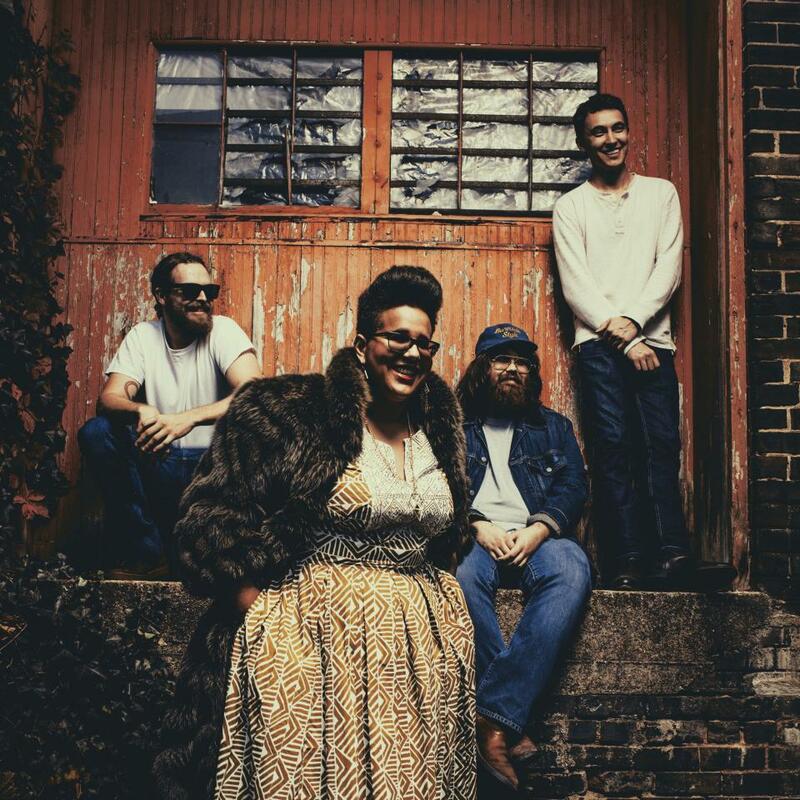 Her most recent album, which was self-titled and released this last spring, perfectly displays her soulful, folk influenced sound and has received critical praise from the likes of The Huffington Post. 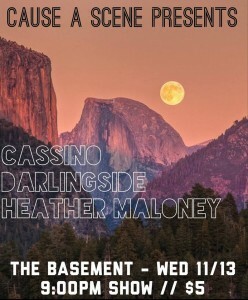 Don’t miss out on another night of good tunes with the CAS crew at The Basement on 8th Avenue South. Tickets will be $5 at the doors. Music starts at 9:00 PM. Back toward the end of last month, Cause A Scene had the joy of hosting Massachusetts-based “string-folk quintet” Darlingside, for what was one of the most fun house shows we’ve ever hosted. One of the really unique things about our houses shows is that for the most part, the people that attend aren’t all that familiar with the artists playing that night. If you’ve been keeping up from our beginning several months ago, that’s no surprise to you. Well, back on July 28th, an entire roomful of people were converted to Darlingside fans and the chatter following that show was more noticeable than after any show we had hosted up to that point. The buzz was palpable and if the band had played a second set, I don’t think anyone would have complained. The five guys (Auyon Mukharji, David Senft, Harris Paseltiner, Sam Kapala, and Don Mitchell) play with such a great deal of heart that it’s easy to get completely swept up with the fervor exhibited on stage. Simply put: their songs mean something. And after seeing their latest video for “Terrible Things”, I think it’s safe to say that their videos mean something, too. It’s at once poignant and hilarious and a great reminder to love people even despite all of their faults and missteps. Their debut album, “Pilot Machines”, is available now. Two nights from now, on Saturday, July 28, Cause A Scene welcomes Darlingside to Nashville, for their first ever performance in Music City. The show kicks off around 8:00 and we have 2 wonderful Nashville bands opening: Peter Terry & The City Profits, who were recently named The Deli Magazine’s Band of the Month, and Matty & the Lovebones. Tickets are available in advance for $5 at the Eventbrite link below and for $10 at the door. Hope to see you there! 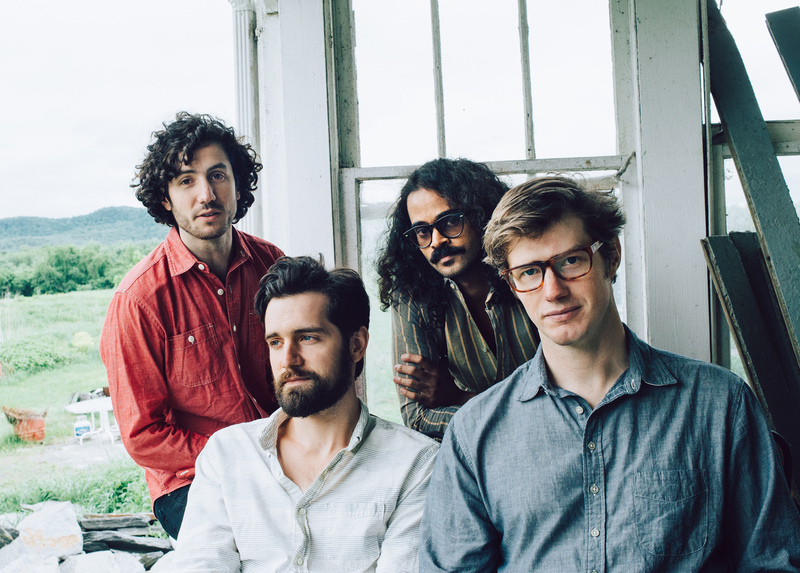 Peter Terry and the City Profits, a folk/rock outfit that blends the soulful, thoughtful lyrics of front man Peter Terry, the sultry sounds of the cello. Originally formed in Chicago, the band now calls Nashville home, where they have been refining their unique sound. Their debut album, I Am Jackson, was released on 11-1-11 on iTunes and Amazon. Individually honing their crafts at various midwestern universities, their exceptional musicianship and creativity allows the City Profits to transform Terry’s songwriting into interesting compositions spanning several music genres including rock, folk, singer-songwriter, jazz, and the blues. Darlingside – Blow the House Down from Darlingside on Vimeo.